As individuals, as groups, as organisations, as societies, we are not leveraging the full power of distributed networks by far. In distributed approaches to many of our current issues is where we will find much needed agency for ourselves. 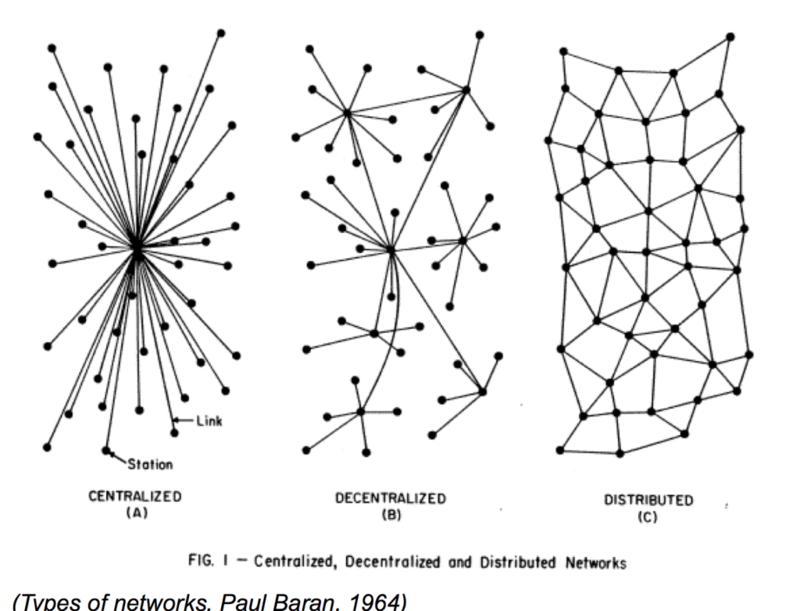 The internet was conceived as a distributed network (item c in the pic above). Physically, in terms of cables, this is true. Practically in terms of functionality, and socially, in terms of people, it mostly is not. Especially for individuals, as the end points of whatever gets provided or done over the internet, the experience is much more like a centralized network (a in the pic), or at best a decentralized one (b in the pic) when I use various services next to each other. Whereas tremendous affordance and power lies in being myself a real node of agency in a distributed network. Facebook is to users a centralized hub, that we interact with, a walled garden. Google, Apple, Amazon all behave in similar ways. Most Internet of Things devices and other connected products require you to stay within one silo. My Sonos speakers can’t play nicely with other wireless solutions. A ‘smart’ thermostat or a smart meter only communicate with their own components, or with the energy company instead of me. Most of it is not open and require us to pick one specific ecosystem to be part of, and voluntarily lock us in. Because for these products and services the easiest path to viable business is in aggregation, providing a measure of control to the business as they scale. Truly distributed solutions are of course available online. Diaspora does what Facebook does, but your data is under your control. The blockchain behind BitCoin distributes transparency and accountability, and combines it with anonymity, even though current implementations end up almost centralized as well. Maker machines leverage the distributed network: the machines allow me to use and produce locally what I find through the networks. With Arduino and Raspberry Pi we have open computing power at our hands that allow us to do much of what centralised and silo’d IoT systems do. The threshold to use truly distributed technology yourself remains extremely high however. If something is difficult, even if it’s ultimately better, I won’t do it if there are easy alternatives. I will not go through the trouble of administering a UNIX server to run my own Diaspora pod if I can join Facebook within a single minute. I will not repair my own fridge door handle if getting my 3d printer to work and drawing a thing takes ages, but I can order a new fridge in 2 minutes and have it delivered tomorrow. Similar patterns I see on the social side, when it comes to learning, organizing, collaborating, creating. Recently I was in another meeting where the participants only knew one mode: sit down to talk with an agenda and discuss things to death, even though what was needed was to just get to work together and do something. But they did not know any of the work forms, methods or instruments you could use for that. Again there is a myriad of proven work methods when it comes to organizing, collaborative structures, decision making, ideation and designing. Methods that build on the diversity and connectedness of groups, on distributedness, on peer to peer. Reducing adoption thresholds of truly distributed technology and peer to peer methods allows an increase in agency. What agency looks like in a connected and distributed world (On Agency pt. 2), and what reducing thresholds to adoption (On Agency pt. 3) looks like in my eyes is for following postings. Hey Ton — I recognize that we are talking about lots of the same things. I am immersing myself in the techie / hard parts of this, so I can serve as a resource for solutions that need to be built with it. Not because I love the tech, but because I love connecting humans, and someone has to be able to bridge between hard and soft. I’m enjoying tech tinkering, also looking forward to when I can surface and share some new tools to experiment with, so we can get on with the important “soft” parts.